“The best thing for being sad,” replied Merlin, beginning to puff and blow, “is to learn something. That’s the only thing that never fails. You may grow old and trembling in your anatomies, you may lie awake at night listening to the disorder of your veins, you may miss your only love, you may see the world about you devastated by evil lunatics, or know your honour trampled in the sewers of baser minds. There is only one thing for it then — to learn. And instead of lying ‘awake at night listening to the disorder’ of my veins, I thought it might be more fun to discover how to tell the difference between a hand-knotted rug and a machine-made rug. I marched down to my local Home World Rugs here in Rochester, Mn, to see if Mr Walker knew what he was talking about. It appears that he did.I took the picture directly below with my trusty Ipad. 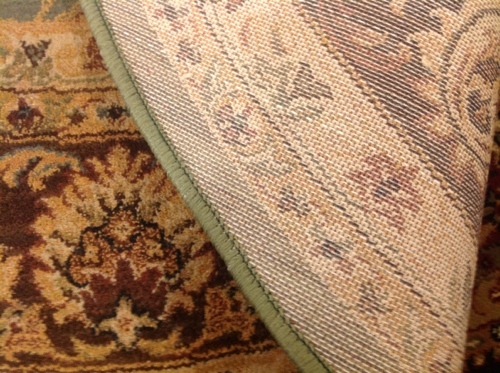 As you can see the various items on the back of the rug are as sharply defined as those on the front. The color is admittedly muted, but not the design. Now take a look at the image below this image. This is a machine made rug. Note how faint the designs appear? The color isn’t just muted, it is washed out! As I’ve learned the difference isn’t always this stark but it is usually pretty obvious anyway. 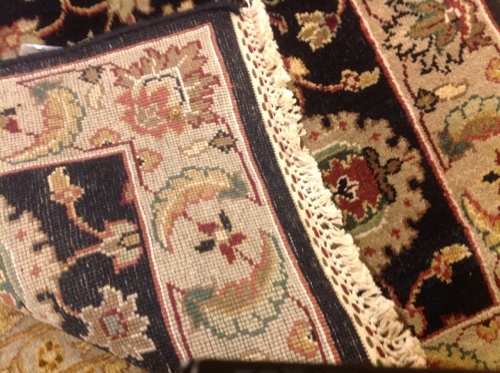 I know this know because I’ve become an inveterate ‘rug flipper,’ embarrassing Patricia, my wife of many years by rambling around peoples homes surreptitiously turning over their rugs looking for…Oh, call it The Truth! My new friend Leela at Hom Furniture, tells me that on the 27th of September, 2013, there will be a special sale on hand-made rugs and a chance to meet some of the buyers. Hope to see you there.